FEB 8 2018 Congratulations to Xiaowei Chi and Yanliang Liang for the recent paper in Angewandte Chemie Int. Ed. as the Front Cover. JAN 20 2018 Yao, Dawlaty and Goyal recently received a Scialog Award from Research Corporation for Science Advancement (RCSA). 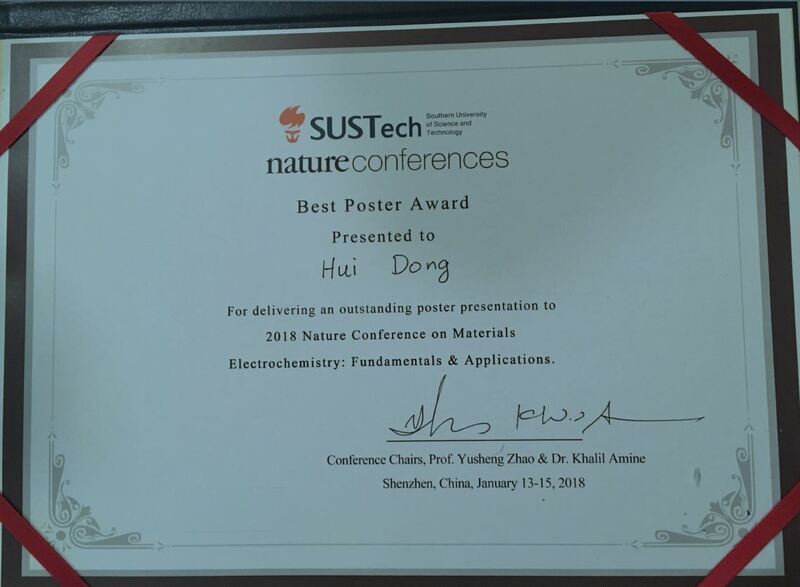 JAN 15 2018 Congratulations to Hui Dong for winning Best Poster Award in Nature Conference on Materials Electrochemistry: Fundamentals & Applications held in Shenzhen, China. OCT 1 2017 We received DOE funding from Vehicle Technology Office’s Battery500 consortium. SEP 1 2017 Prof. Yan Yao is promoted to the rank of Associate Professor with tenure. APR 6 2017 First year graduate student, Karun Rao, is selected by NASA to receive prestigious NASA Space Technology Research fellowship. APR 5 2017 Prof. Yan Yao is selected as a Scialog Fellow on Energy Storage by Research Corporation for Science Advancement. JUL 14 2016 Congratulations to Rongguang and Swami on their paper as the Front Cover of Nanoscale. 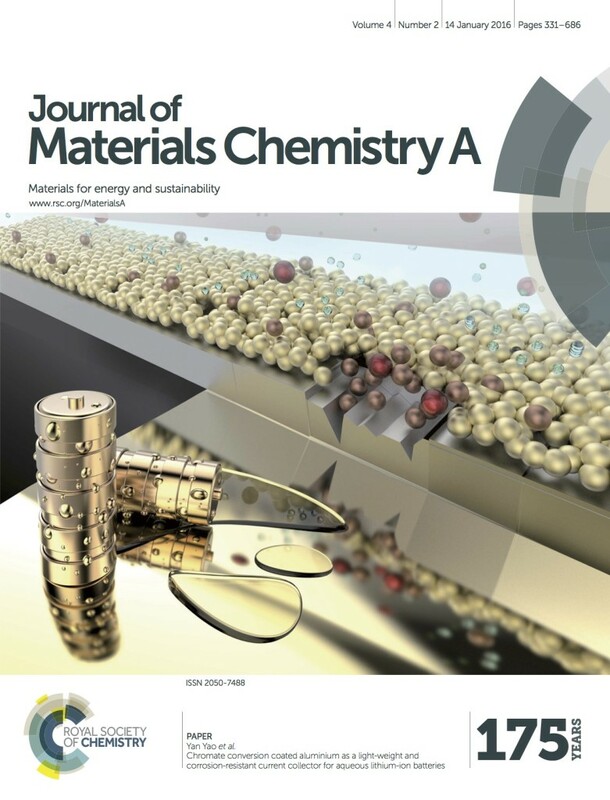 JAN 5 2016 Congratulations to Saman Gheytani on his first paper as the cover of the Journal of Materials Chemistry A. Saman discovered a method for a light-weight and corrosion-resistant coating for aqueous batteries. 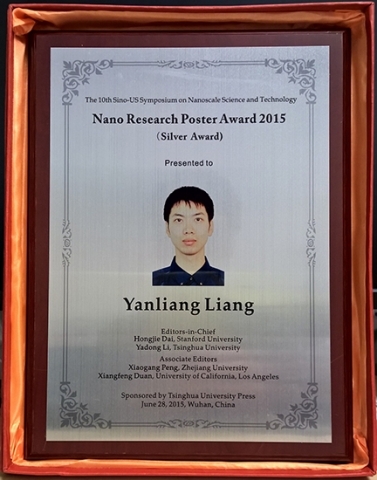 OCT 25 2015 Congratulations to Len Liang for winning the Silver Nano Research Poster Award at the 10th Sino-U.S. Symposium on Nanoscale Science and Technology in June! 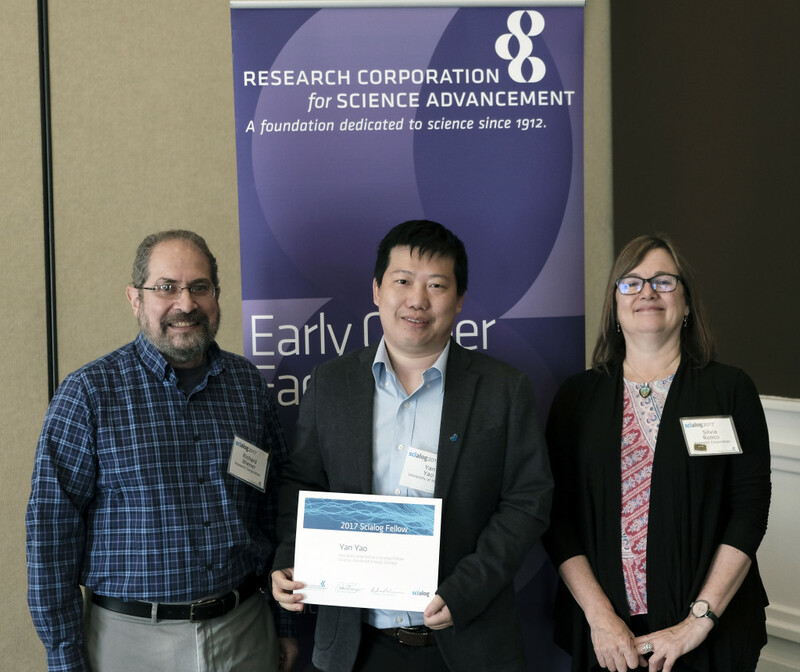 Liang’s poster titled, “Rational Nanostructure Design for Efficient Mg Rechargeable Batteries,” was among more than 200 posters submitted and was one of only eight that earned awards. The symposium, sponsored by Tsinghua University Press, attracted more than 1,000 attendees. APR 6 2015 Our recent work on N-Type polymer for ultrafast organic batter has been highlighted by online sites include UH, ScienceDaily, EurekaAlert, Phys.org, etc. APR 29 2014 Congratulations to Yifei Li for his recent two awards! He received the “Urvish Medh” award for the best overall presentation at the UH ECE Graduate Research Conference and the third place in the TcSUH’s 47th Semiannual Student Symposium with total $600 prize. Good job, Yifei! APR 24 2014 Congratulations to Yan Jing for passing his qualify exam! Well done, Yan! JAN 17 2014 Dr. Yao is co-organizing a Symposium of Batteries and Fuel Cell Technologies: Challenges and Solutions Towards Global Stewardship (ENFL Division of Energy and Fuel) at 248th ACS Meeting during the week of August 10-14, 2014 at San Francisco. DEC 1 2013 Welcome Dr. Yoo, Dr. Jian, and Xiangyue join our group. Aug 21 2013 We are very excited to receive ARPA-E funding for developing advanced aqueous lithium-ion batteries. List of ARPA-E funded RANGE Projects. July 30 2013 Experiential Learning: Undergrad Research in Energy Storage. David is featured in UH Engineering News. Link. Jun 27 2013 Photos: Inside ECE Professor Yan Yao’s Laboratory. Our newly renovated lab is featured in UH Engineering news. Link. Jun 21 2013 Dr. Yao hosted a lab tour for the STEP Forward Summer Camp. A group of high school students showed strong interests in the fuel cell car and battery demo David Pineda conducted. The information for STEP Forward camp can be found here. Jun 19 2013 Dr. Yao led UH first SURF graduate and professional round-table discussion. Dr. Yao served at the table of Materials Science to discuss career interests with SURF students. Jun 17 2013 Tiffany Au, Jamie Bassett from St. Agnes High School and Kyle Affeldt from Lansing High School joined the group for a two-week summer research. Jun 3 2013 David Pineda joined the group as a SURF (Summer Undergraduate Research Fellowship – UH) student. For more information, check the SURF website. May 21 2013 Joeseph Whitehouse from UT San Antonio joined the group as a REU (Research Experience for Undergraduates) student. He will stay in the group for conducting 10-week research. The link for REU program at UH CCE can be found here. May 09 2013 Dr. Yao presented an invited talk at Schlumberger, Sugar Land Technology Center. He is very excited to meet many UH ECE alumni there! Apr 14 2013 Yao group set up a booth at Houston’s Earth Day Event in the Downtown Discovery Green field. We demonstrated lemon batteries towards K-12 students. Apr 11 2013 Dr. Yao presented an invited talk at 245th American Chemical Society Meeting at New Orleans, LA in the ENFL division. Mar 13 2013 Dr. Yao presented an invited talk at Southwest Research Institute, Advanced Vehicle & Hydraulic Vehicle Technology. Mar 1 2013 Dr. Yao served as a judge in 2013 Science and Engineering Fair of Houston for the 9th Grade Engineering Students. He nominated two awards sponsored by TcSUH. Feb 24 2013 Dr. Yao attended 4th annual energy innovation summit in Washington DC. Jan 15 2013 Dr. Yao served in a panel in the National Science Foundation. Dec 24 2012 Yan Jing joined the group. Welcome! Dec 06 2012 Dr. Yao served as a reviewer for UCLA first annual review of engineering student scholarship applications. Dec 04 2012 Dr. Yao served as a judge for UH Capstone Design Conference. Nov 01 2012 Yanliang Liang joined the group as the first postdoc. Welcome! Oct 20 2012 Yao group set up a booth at the Houston’s annual Energy Day, and demonstrated energy innovation towards K-12 students. Oct 11 2012 Dr. Yao served as a session chair in 222nd Electrochemical Society Conference for Lithium-Ion Batteries Session. Sep 15 2012 Yifei Li joined the group as the first student. Welcome! Sep 01 2012 Dr. Yao joined the University of Houston as the Assistant Professor in the Department of Electrical and Computer Engineering. He has a joint appointment in the Materials Engineering Program. Oct 05 2011 Yan’s paper titled “Electrically Conductive, Mechanically Robust and Electrochemically Inactive TiC/C Nanofiber Scaffold for High Performance Silicon Anodes Batteries” is published online on ACS Nano. Sep 30 2011 Yan presented in Nanomaterials for Energy Symposium held at the University of Toronto. Sept 21 2011 Yan presented his research in ABAA-4 in Beijing, Sept 21-23, 2011. Jun 28 2011 Yan’s paper titled “Effects of solvent mixtures on the nanoscale phase separation in polymer solar cells” is the most-cited Advanced Functional Materials paper during recent three years, with over 400 times of citations up to date. Jun 14 2011 Yan’s paper titled “Interconnected Silicon Hollow Nanospheres for Lithium-Ion Battery Anodes with Long Cycle Life” is published online in Nano Letters. Apr 26 2011 Yan gave two talks on Si light trapping and energy storage in MRS Spring Meetingat San Francisco. Dec 21 2010 Yan’s first review paper in Stanford titled “One dimensional Si/Sn – based nanowires and nanotubes for lithium-ion energy storage materials” is published in J. Mater. Chem.